What is Hemingway Editor ? 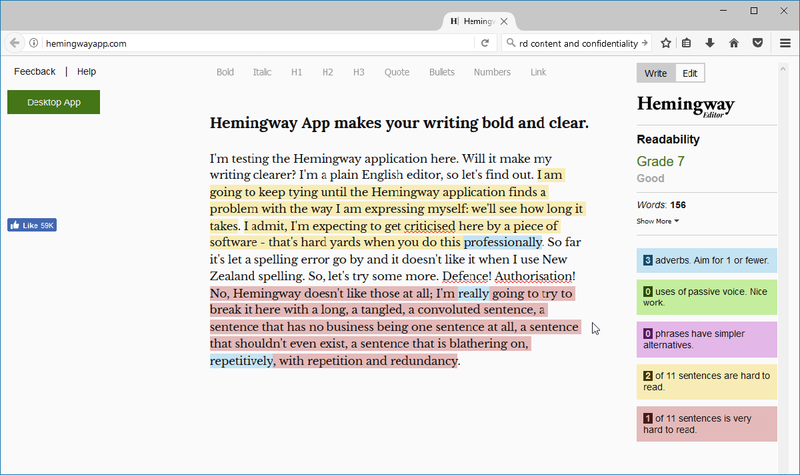 Hemingway Editor is a tool designed for seasoned writers and novice alike. It is a word processor and proofreading app that helps writers of all levels create simple, powerful and clear content. Users can access Hemingway Editor online or download its desktop version. The tool works by detecting hard to read sentences, passive voices, complicated words and phrases, and even the presence of adverbs. All these errors can be seen easily because the program uses color coding to highlight the issues in the texts. Hemingway Editor’s latest version comes with features that allow users to apply italic and bold font styles and add headlines and bullets to the texts. Additionally, the program can be integrated with Medium (an online publishing software) and WordPress (a content management system). With this integration, all users can directly publish their finished works to any of these programs with the help of Hemingway Editor’s app. And of course, users can write their texts directly on the app without using other word tools. When your composition contains issues, Hemingway Editor will instantly highlight them so you will see which part needs improvement. The app uses color coding so you will detect the level of error in the composition. When you see a yellow highlight in some parts of your texts, it means your composed phrase is hard to read. Nobody wants to create a write-up that is jam-packed with grammar errors. That is why Hemingway Editor is designed to help you improve your writing style. The app can help you remove your complex words and phrases, create concise and clear sentences, and ensure that your sentences are flowing smoothly. Long and hard-to-read sentences can be identified easily using Hemingway Editor. These kinds of sentences are highlighted in red. For complex words and phrases, the app uses purple highlight to show their presence. To correct he complex compositions, you can either replace them or follow the app’s suggested alternatives. Adverbs can undoubtedly weaken the verbs you modify. But don’t worry, the app will help you eliminate them or improve your sentence by suggesting you alternatives. Adverbs will be highlighted in blue and the passive voice in green. Hemingway Editor lets you import your texts from one text editor to another so you don’t need to copy and paste them when you need to edit your work. When you’re done editing and revising using Hemingway Editor, your texts will then be exported as Word or PDF file. From the app, you can publish your work easily to WordPress or Medium, be it a draft or a live post. You can even import the texts as HTML so you can publish them to web pages or any blogging platforms.